This most numerous of insects provides further variety to the trout's diet and is an essential consideration for the discerning flyfisherman. Beetles come in both terrestrial and aquatic species. All belong to the order Coleoptera. Many of the terrestrial beetles are able to fly and thus fall into lakes and streams but the majority will simply fall in from overhanging growth. Although beetles will range in size, generally those fished in our area will be a round or oval shaped. In addition, when choosing a color, most beetles will be black, dark brown, dark olive or red. Although beetles evolve through larva and pupal stages, the adult is the only pattern of predominant interest to the fly fisherman. 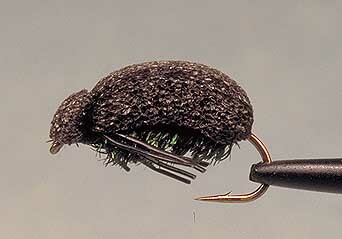 Generally, the beetle will be found closer to the bank of a stream or lake than a hopper or flying ant, so casting a beetle pattern will require one to almost lay the fly on the bank and let it drop into the water. Beetles are unwieldy and clumsy and therefore tend to fall into the water. So unless there is a lot of larger overhanging branches which stretch some distance across a stream or river, the beetles will tend to fall in close to the edge. The only exception would be a beetle which falls into the river during flight. Consequently, the preferable way to fish beetles is to ascertain where they are most likely to hit the water and then fish to that area. Generally therefore, most of the fishing will be towards the bank of the river or lake. One will therefore cast almost onto the bank. The consequence is that often flies will catch the grass or undergrowth. But frankly if you don't catch grasses and branches from time to time you are not fishing close enough to the edge. In bright light, in particular large trout will hold under undercut banks. So the only way to tempt them out will be to cast close enough so that they are willing to risk leaving the dark and take the fly floating by. It will therefore be important for you to inspect and understand the river or lake bank structure as well as the vegetation on the bank. Fishermen familiar with an area will know where the undercut banks and deeper holes are which could hold a trout during the brighter part of the day. Furthermore, beetles will hit the water with a mild disturbance. That will serve to attract the trout's attention. It may spook the trout in some cases, but generally it is the best approach. Carry several sizes and shapes of beetle patterns unless you have an intimate knowledge and confidence in the area you are fishing. Generally one would advise carrying black, dark green, dark brown and dark red patterns at the very least.